Americans have always purchased new cars to shake memories of harder times. But while smiles will glimmer in the paint of 17 million new cars this year, one model may reflect more teeth than any other: the Mazda MX-5 Miata. In 1989, the Miata wrote a new testament chapter in the gearhead chronicles, invoking the long-dormant spirit of British and Italian roadsters. The key difference? Unprecedented Japanese quality. That first year, Mazda’s open-air prophet minted nearly 40,000 acolytes, sparking a wave of mostly pricier followers from BMW, Audi, Mercedes-Benz, Honda, Porsche and General Motors. Giving all its 155 horsepower in the lonely canyonlands north of Los Angeles, the 2016 MX-5 Miata reminds us that you don’t need 600 horsepower or a six-figure tab to have a great time behind the wheel. Priced from $25,735, the redesigned Mazda reaffirms its status as the Wes Welker of sports cars: seemingly out of its league, until the little waterbug jukes past the muscleheads and into the endzone. 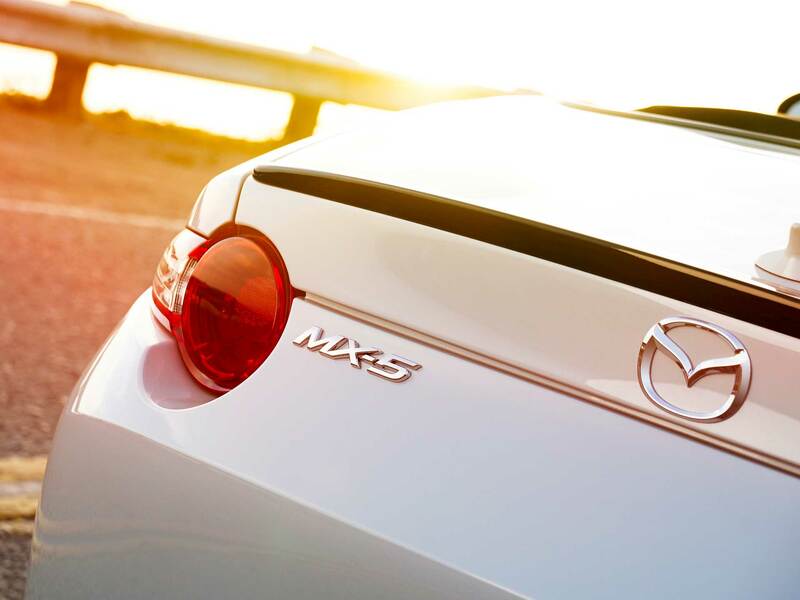 Not even the most sun-stroked Mazda executive expects this fourth-generation Miata to make the seismic splash of the original. As they had 26 years ago, today’s buyers have largely forgotten convertibles, preferring to dull their pleasure centers with practical SUVs and crossovers. Mazda posits that many millennials have never driven or even sat in a convertible. Talk about sheltered existences. “A lot of people think that Uber and the Prius is as fun as it gets,” says Rod McLaughlin, the MX-5’s vehicle line manager. Yet Mazda leaders express cautious optimism for the Miata’s prospects in a booming market, and not just among its familiar Boomer cult. So as a former Miata owner myself—a black ‘92 SE with tan leather and aftermarket BBS wheels—may I present the handsome new baby: a car that, if Pixar needs a tie-in, should be the official car of Joy, Amy Poehler’s cheer-enforcing character in Inside Out. “Great. Still a chick car,” some may say. That misbegotten image is traceable to the cigar-stanking Club for Hopelessly Insecure Men. What Biff and his gang don’t know, or refuse to acknowledge, is that more Miatas compete on the world’s racetracks than any other model. And last we checked there was nothing overtly feminine about racing, even if you ask the talented women who jostle with the good ol’ boys for rightful position. Even so, the Miata does get a shot of styling testosterone for 2016. A lowered body coils and flows, with a sidelong wink to Alfa Romeo. LED eyeballs squint like Clint Eastwood in the saddle. Wheels and tires of up to 17 inches bulge from their corners, and grip like a desperate Iowa pol on sky-scraping curves through Angeles National Forest. Front roof pillars are shoved back 2.8 inches to accentuate classic, long-hooded roadster proportions. From the driver’s enhanced POV—including an inch-lower hood—the peaked front fenders recall a Corvette. The Miata is actually a touch tinier than its predecessor, riding on a 0.6-inch-shorter wheelbase and having shed about 150 pounds. Considering the obesity epidemic of modern cars, a curb weight of 2,332lbs (2,380 with a six-speed automatic transmission) is remarkably just 182 over the original’s, and about 550 fewer than today’s Porsche Boxster. Bentley cuts 220 lbs from its 5,100-lb Continental GT V-8 and calls the resulting GT3-R a beneficiary of “lightweighting.” The Miata scoffs at these efforts, and with good reason. Credit lavish use of high-tensile steel and largely aluminum bodywork, including an aluminum panel that stiffens the cloth top to quell cabin noise. That redesigned manual roof pops open with the one-finger ease of a Coors Light can, with a helper spring for easy closure. 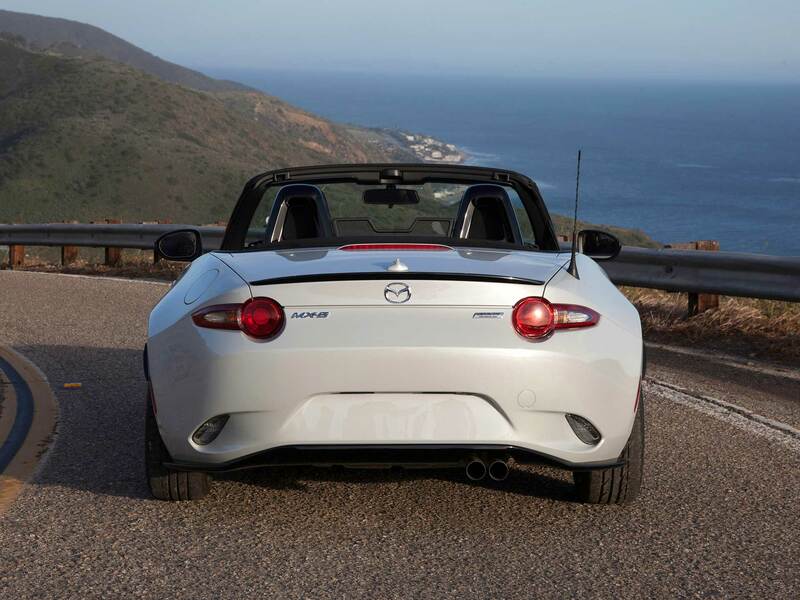 For the first time, a driver can reach back and erect a Miata’s top while facing forward, and without risking a rotator-cuff tear. A cloth roof this good seems to negate any need for a retractable hardtop, but Mazda will likely bring one to market, given a solid majority of buyers chose this option in the car’s previous generation. "The roof pops open with the one-finger ease of a Coors Light can." Inside, the Miata still fits like a slim Paul Smith suit, with the new model designed from scratch around its pilot, including a seat lowered by 0.8 inches to get closer to ground-floor action. But slender new seats, lighter by 17 lbs, allow more recline. The interior is airier and richer—especially in the leather-clad, $30,885 Grand Touring model—with a raft of new features or apps controlled by Mazda’s intuitive console Commander knob and central screen (though we must ask, does a Miata really need an optional blind-spot monitor?). Snugging into the $29,420 Club version, we aim for the California wilderness. This performance-first Club model eschews luxury features in favor of a limited-slip differential and shock tower brace (only on manual-trans models), stiffer Bilstein shocks, a front air dam and rear lip spoiler. For that Club model, a $3,400 package adds red-calipered Brembo brakes with forged BBS wheels, a rear bumper skirt and side sill extensions. On paper, the 155 hp of the 2-liter four-cylinder engine reads like a retreat from the peak 167 hp of the previous model. Read again: Peak torque rises to 148 pound-feet, up from 140, and there’s more horsepower everywhere between 1,000 and 6,000 rpm. For this rear-drive application, the 2-liter gets a new cylinder head, intake and exhaust manifolds, and a 20-percent lighter flywheel. Unlike versions in the Mazda3 and other models, it’s tuned for premium fuel, which optimizes throttle response and prevents engine knock. Whipsawing through the parched San Gabriel Mountains, the Mazda shows it’s no steroidal Tour-de-Francer, huffing and puffing as it does on steep ascents. But when the road flattens, the car sprints to 60 mph in about 5.9 seconds. That’s just a few ticks behind a Porsche Boxster, despite the Miata’s 110-horse deficit. 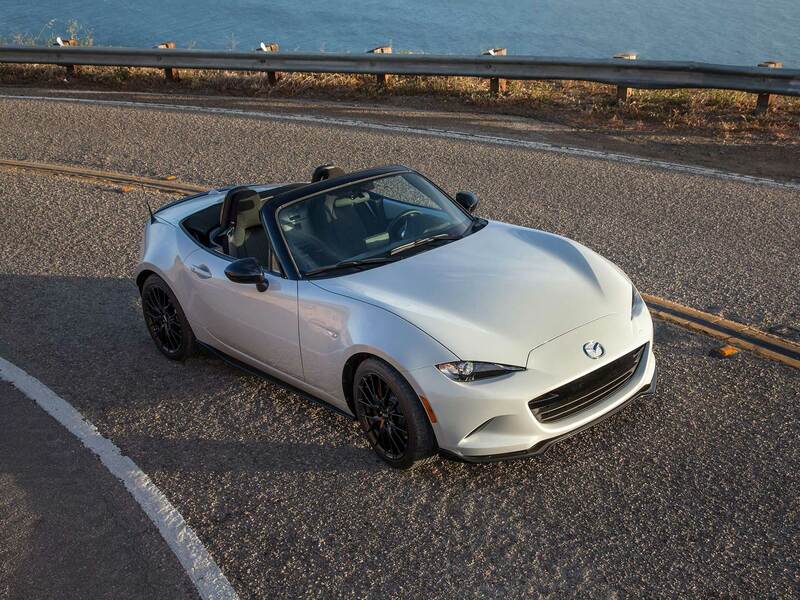 No model sells a higher percentage of manuals than the Miata: a full 62 percent of the 2014 model’s soft-top buyers and 45 of the hard-toppers chose a stick, higher by far than any car that offers both manual and automatic. 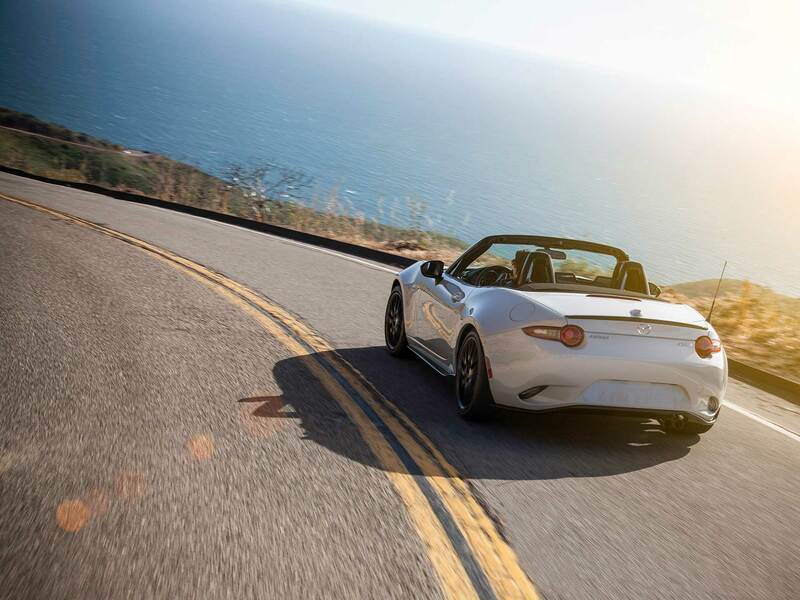 The Miata’s latest six-speed is a marvel of short throws and can’t-miss engagement. 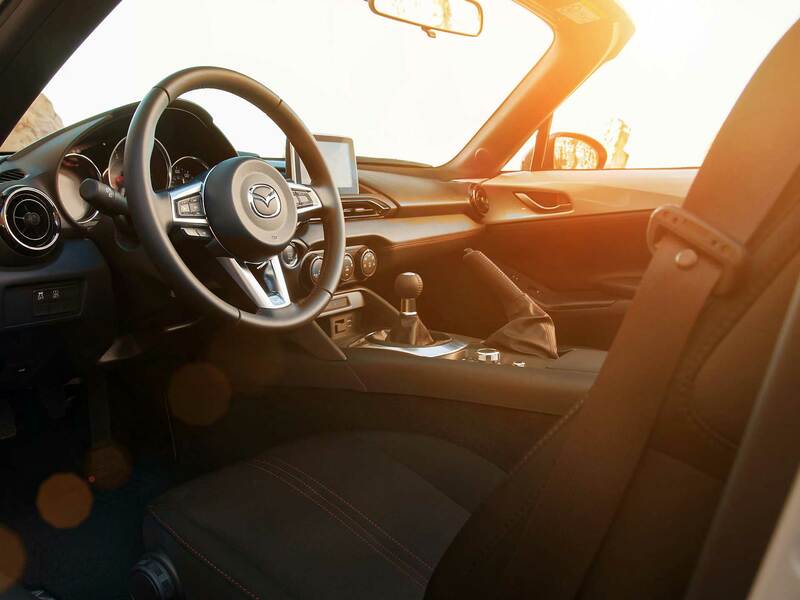 Gear changes seem to flow from your fingertips, aided by the Mazda’s ideal relationship of driver to the shifter, pedals and steering wheel—all critical to the enjoyment of a car that requires constant toggling of its red-stitched shifter to build and maintain speed. Developed on Mazda’s fuel-saving temple of SkyActiv technology, the engine does sacrifice a thrillingly high redline and urgent exhaust yawp. The upside is a 25-percent gain in fuel economy, to an expected 27 mpg urban, 34 mpg highway federal rating, or 27/36 in automatic guise. With its improved ride, the Mazda feels downright plush over rude, sand-frosted backroads. The reworked suspension, including aluminum double wishbones up front, has enough sinew to handle the fast stuff. New electric rack-and-pinion steering feels as light as meringue, though the Miata faithfully transmits g-forces wherever they’re encountered. Even in tightened-up Club guise, however, the body can get squirrelly, bobbing and resisting fast steering inputs before it takes a confident set into the corners. Mazda engineers said they intentionally baked some compliance into the suspension, the better for drivers to sense weight shifts. The suspicion is that Mazda, perhaps rightly, designed to its core audience: drivers who want a sunny cruiser first, autocrosser second. Our plea to Mazda is simple: Build a buttoned-down Mazdaspeed version, and skip the will-they-or-won’t-they dithering. Still, the Mazda eagerly pursues its limits at speeds that don’t threaten your license, life or limb. It’s a glider, not a fighter. As it does on track, where skilled owners routinely embarrass rookies in more powerful cars, the Mazda rewards those who can carry momentum through curves. When the Mazda’s rear end finally breaks loose, as it does across one sand-washed hairpin, the slide is blissfully easy to catch and correct. So what kind of showroom reception might the Miata receive, as the market’s only remotely affordable roadster? (Fiat’s upcoming 124 Spider will make two, an Italian job based on the Miata). Americans bought fewer than 150,000 convertibles on average during recession years, from a peak of nearly 420,000 in 2001, according to LMC Automotive. The Miata itself hasn’t found even 10,000 buyers in any year since 2007, barely a glimmer of its heyday. A repeat of the Miata’s Miracle of ‘89 is not iminent. But this little dickens waves the same fluttering banner of defiance as its forebear. Cars made solely for fun have an inalienable right to exist. Ye multi-row plodders, go ahead and blend with the bourgeois Monday commute. We won’t be joining you, not while this sun still shines.